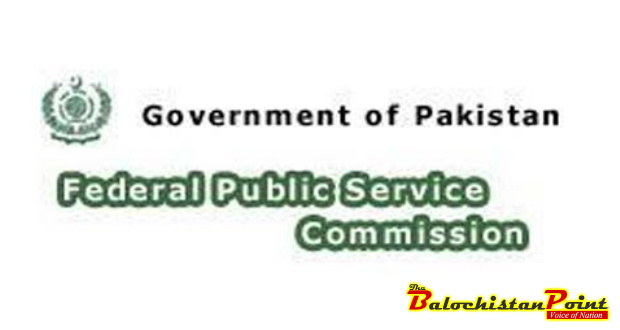 Quetta – A detailed study of vacancies announced by Federal Public Service commission (FPSC) hints towards systematic deprivation of Balochistan in federal jobs quota. FPSC is an autonomous body that is constitutionally mandated to carry out recruitment on federal government vacancies for jobs of scale BS-16 and above. Federal government jobs are distributed among four provinces of Pakistan, FATA, Azad Jammu and Kashmir (AJK) And Gilgit-Baltistan (GB) according to a prescribed Quota. Balochsitan’s quota is 6 percent in Federal jobs. The Balochistan Point studied the newly advertised vacancies by FPSC to investigate systematic deprivation of Balochistan. On 2nd August, FPSC announced 156 vacancies in 19 different categories. These vacancies comprise of jobs from BS-16 to BS-18 in different departments and organizations under federal control. Balochistan has only been allocated just 5 vacancies out of 156 advertised vacancies. As per 6 percent quota, Balochistan share should have been allocated 10 seats but actual allocation is 5 seats less than the quota. 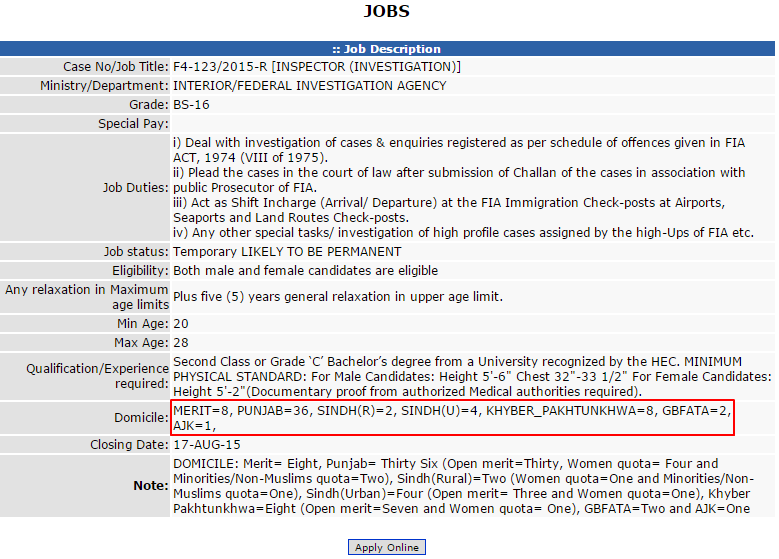 Balochistan has been completely ignored in the allocation of important vacancies such as Inspectors for Federal Investigation Agency (FIA). 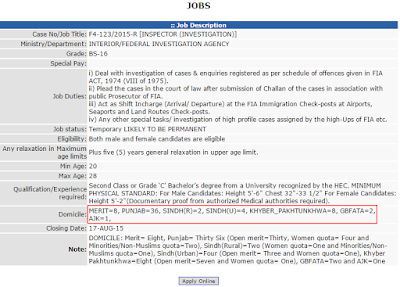 Out of 61 vacancies of Inspector FIA, not a single one has been allocated for Balochistan. Even Azad Jammu and Kashmir and Gilgit-Baltistan have been given allocations but not Balochistan. These inspectors, among other duties, can also act as shift In-charge at the FIA Immigration Check-points at Airports. People of Balochistan have often complained about the treatment that they receive at Airport immigrations counters. Author is eyewitness to the discrimination that Shalwar-Kameez wearing Balochistan citizens face at FIA Immigration Check-points and Anti-Narcotics Force (ANF) check points at Airports. Despite repeated attempts by The Balochistan Point to make contact, Secretary FSPC was not available for a comment on quota rules violation for Balochistan. Current vacancies announcement by FPSC is not first instance of violation of Balochistan Quota. On 27th July Quetta Electricity Supply Company (QESCO) a federally controlled entity, also violated Balochsitan’s job quota in 45 vacancies that it advertised. Out of 47 vacancies of BPS-17, not a single one was allocated for Balochistan. QESCO was asked to stop recruitment process by Chief Secretary of Balochistan after he took notice of the protests from civil society of Balochistan against violation of quota rules. “In my capacity as a member of different Senate standing committees, I have put up questions with PIA, HEC, CDA, OGDCL, SNGPL, SSGC and other departments and asked them to explain how they are fulfilling 6 percent quota of Balochistan,” Senator Jehanzeb Jamaldini told The Balochistan Point. Senator Jamaldini further revealed that people of other provinces possessing fake domiciles of Balochistan take jobs on what’s left of Balochsitan’s quota. “DMG officers serving as Deputy Commissioners and Assistant Commissioners have issued domicile certificates to their relatives, in huge numbers, which are used to deprive people of Balochistan form their quota in jobs,” claimed Senator Jamaldini. In a move which was severally criticized by people of Balochistan, Last year, Federal government declined to commence recruitment on 3,692 Federal jobs reserved for Balochistan.